One way to avoid potential issues of being an overqualified job candidate is to limit your work history on your resume. 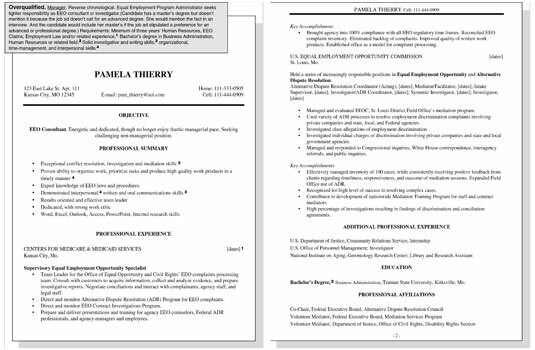 The sample resume shown below is a targeted resume for an overqualified worker who is seeking a job with lighter responsibility than her previous positions. By carefully targeting resumes for specific jobs and situations, you can greatly improve your chances of getting noticed in the job market. This example uses the reverse chronological resume format, which is recommended if you have a steady work history with a clear pattern of upward or lateral mobility. In this case, the applicant’s resume focuses on recent work experience and omits her advanced degree because the position she seeks doesn’t require it. A gray box atop the sample resume contains a mission statement that details what this job seeker aims to accomplish. The mission statement also includes the typical requirements for this type of occupation or career field. Notice that the numbers listed with the requirements shown in the gray box are cross-matched to qualifications shown in the resume. The cross-matched numbers between the job’s requirements in the gray box and the candidate’s qualifications shown in the sample resume are just for illustration, not for your actual resume. This resume sample is intended to focus your attention on requirement-and-qualification matching, the most important factor in causing your candidacy to get noticed during a job search.